Key difference: The Alcatel One Touch Idol Ultra features a 4.65 inch HD AMOLED capacitive touchscreen with a resolution of 720 x 1280 pixels. The phone is powered by Dual-core 1.2 GHz processor on a MediaTek MTK 6577 and 1 GB of RAM. The phone has a width of 6.45mm, which has led the company to tout it as the thinnest smartphone on the market. HTC First is the first phone that will be released running on the Facebook Home user interface. The phone will be powered by a Qualcomm MSM8930 Snapdragon 400 1.4 GHz Dual-core Krait and a 1 GB of RAM. The Alcatel One Touch Idol Ultra features a 4.65 inch HD AMOLED capacitive touchscreen with a resolution of 720 x 1280 pixels. The phone is powered by Dual-core 1.2 GHz processor on a MediaTek MTK 6577 and 1 GB of RAM. The phone runs on Android OS, v4.1 (Jelly Bean). Alcatel One Touch Idol Ultra also features an 8 MP primary camera with digital zoom and LED flash, as well as 1.3 MP secondary front-facing camera for video calls. The phone comes with 16GB of internal storage, of which 13.3 GB is available to the user. The device also supports MicroSD to expand external usage up to 32 GB. The phone has a width of 6.45mm, which has led the company to tout it as the thinnest smartphone on the market. However, to get this accolade of the ‘thinnest smartphone’, the device has had to compromise on some matters, such as the phone does not feature an audio jack. The phone does come with a USB to 3.5 mm jack adapter, which means that the USB port doubles as an audio port. In today’s world, social networking is more important than air of water. Facebook realizing the important part it plays in people’s social lives and recognizing the need for Facebook integration on mobile phones, has collaborated with HTC for new Facebook phone: the HTC First. 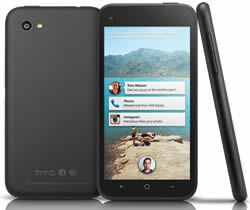 HTC First is the first phone that will be released running on the Facebook Home user interface. This isn’t the first time that HTC and Facebook have collaborated. HTC has previously launched the ChaCha, Status, and Salsa, all of which had special Facebook integration, beyond the normal app. However, the HTC First will be the first to actually have a user interface (UI) based on Facebook. The Facebook Home UI will consist of Cover Feed which will use the home screen and lock screen to show content posted by friends on Facebook, as well as notifications from other apps. It also has an overlay over any and all apps, which allow users the ability to message others via Facebook or SMS, without leaving the app. The lock icon on the lock screen will show the profile picture of the user. The HTC First also offers the users the ability to turn off the Facebook Home UI, in case they choose to. When Facebook Home is disabled, the phone will revert to stock Android, in this case Android 4.1 Jelly Bean. The phone will also be the first smartphone to include Instagram, recently-acquired by Facebook, as a pre-loaded app. The phone will be powered by a Qualcomm MSM8930 Snapdragon 400 1.4 GHz Dual-core Krait and a 1 GB of RAM. The phone will come with as in-built memory of 16 GB and no external memory. The phone also has an embedded Li-Po 2000 mAh battery. The phone has a 4.3 inch Super LCD capacitive touchscreen with a resolution of 720 x 1280 pixels. The primary camera on the phone is a 5 MP with BSI sensor and a 1.6 MP front-facing secondary camera, also with BSI sensor. The information for the detailed table about the two phones has been taken from the Alcatel One Touch Idol Ultra website, the HTC website, theverge.com and GSMArena.com.